The Circle Michigan Foundation will also award a transportation grant to a Michigan school, any K through 12 educational institutions within the State of Michigan. This grant will be used for transportation for field trips. 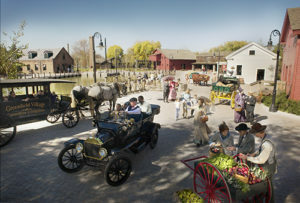 Any attraction being visited by the school group must be a Circle Michigan member/attraction. If your school will be visiting more than one destination/attraction on the field trip, at least one attraction must be a Circle Michigan Member. For a list of Circle Michigan Members click here. Transportation Grant application period is April 1, 2019 – June 30, 2019. The grant recipient will be notified by August 1, 2019. Grant is to be used during 2019/2020 school year from September 1, 2019 – June 30, 2020. A copy of a quote or invoice from a transportation entity is to be included with application. The 2019/2020 award will be up to $500.00. Thank you for the grant to be able to take a bus to the Iron Mine. The kids has so much fun riding with all their friends and loved going to the Iron Mine.